Peer through a magnifying glass at a snowflake, and you’ll see an ice creation more elaborate than anything Martha Stewart could cut from folded paper. So what’s behind the snowflake’s unique and elaborate shape? The snowflakes that settle upon our sleeves and scarves during a snowstorm have more variations in shape than you might think. There’s the classic snowflake: a flat plate with branchlike, dendritic arms. Some look like hexagonal prisms; others like hollow pencil-shaped columns or tiny needles. We tracked down two ice experts to help answer the question: Kenneth Libbrecht, a physics professor at the California Institute of Technology and avid snowflake photographer, and John Hallett, director of the Ice Physics Laboratory at the Desert Research Institute in Reno, Nev.
A few facts about snow crystals: They are formed from water vapor that condenses directly into ice inside of clouds. They take shape as water vapor molecules from cloud droplets condense and freeze on the surface of a seed crystal, and patterns emerge as these crystals grow. The seed crystal itself forms on a tiny particle, like a speck of dust in the air, which serves as a base for ice growth. Note: Snowflakes are not created from frozen raindrops. Liquid water that freezes in the atmosphere as it falls to the ground is actually sleet. And hail, Libbrecht said, is just a large piece of sleet that collects water and grows as it travels from the atmosphere to the ground. Water molecules — made of one oxygen and two hydrogen atoms each — are ultimately responsible for the familiar six-sided shape we associate with snowflakes. Temperature and humidity are the two main factors that influence how the crystalline structure forms. If the temperature and humidity level changes, so does the growth pattern of the crystal. At low humidity you get simple plates and simple hexagonal blocks, Libbrecht said. At higher humidity, more branched structures. We see that thin plates and stars grow around -2 C (28 F), while columns and slender needles appear near -5 C (23 F). Plates and stars again form near -15 C (5 F), and a combination of plates and columns are made around -30 C (-22 F). 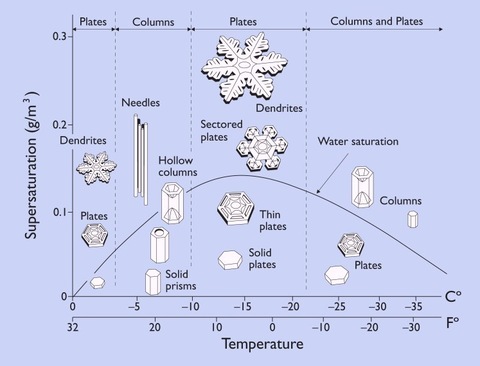 Furthermore, we see from the diagram that snow crystals tend to form simpler shapes when the humidity (supersaturation) is low, while more complex shapes at higher humidities. The most extreme shapes — long needles around -5C and large, thin plates around -15C — form when the humidity is especially high. But the physics is far from exact, Libbrecht said. And though it may appear otherwise, the arms of a snowflake are not perfectly symmetrical. So is it really true that no two snowflakes are alike?